Geneva, October 2017: SRI has launched the new WEEE Policy design guidebook at the World Resources Forum 2017 in Geneva. This guidebook is based on the pioneering process in Colombia, which has led to the publication of the first WEEE policy in Latin America this year. Sandra Mendez presenting the WEEE Policy guidebook at WRF2017. WEEE management in developing countries and related policies and legislation were key topics within the WRF2017 workshop “The e-waste challenge” organized by the German GIZ, the StEP Initiative and the World Resources Forum. Workshop findings included that for the creation of a legislative bases, it is crucial to strengthen levels of coordination, cooperation, and involvement by all pertinent actors to implement schemes based on Extended Producer Responsibility. The “Practical Guide for the Systemic Design of WEEE Management Policies in Developing” was presented by WRF project associate Sandra Mendez, offering a sustainable approach for the design of policies as a long-term planning instrument. The guidebook is based on the Colombian experience, Colombia having been involved in the SRI program since 2013 and with its predecessor programme (the Swiss e-waste programme) since 2007. 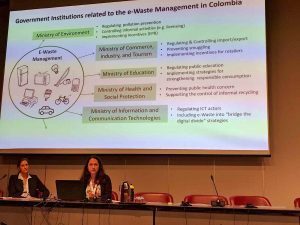 The creation of a National WEEE management policy has been a key result, launched in June 2017 in Bogotá by the Ministerio de Ambiente y Desarrollo Sostenible (MADS). This success story now has been turned into a generic WEEE Policy design guidebook. This offers other developing countries the opportunity to tab on this wealth of experiences from Colombia and design their own WEEE policies. As Andrea Lopez, who was leading the policy development process for MADS stated: “This policy is a contribution to the development of public policies in Latin America, thanks to its formulation and design process with a systemic approach”. Governments now have a tool at hand to lead the design of national WEEE policies, engage all relevant actors and increase their empowerment and responsibilities for sustainable solutions. Applying the methods of the guidebook leads to tangible (quantitative) products—such as the policy itself, reports, or records of meetings and agreements, as well as and intangible products, such as the actors’ learning processes or enhanced knowledge of the system. In general, international cooperation and learnings from successful experiences in a South-South exchange has been important to support the development of WEEE management strategies in developing countries. As such, this guidebook will be beneficial for any institutions or experts who are supporting developing countries in tackling WEEE management challenges. The guidebook can be downloaded in an English and Spanish version.